Mark comes in, speaking with a French accent. He tells Annalise that he is the new chef at Lassiter's. Annalise asks him why he's speaking with a French accent - she heard him speaking with an Australian accent before! Mark admits that it was a con - he did it because hotels fall over themselves to get real French chefs. Annalise can't believe that Lassiter's fell for it! Annalise introduces herself to him and when Mark tells her his full name, she remarks that Stephen and Phoebe are her bosses. Mark makes her promise that she won't tell Stephen that he's in town. Annalise agrees but wants to know what the connection is. Mark asks if she can keep a secret, before revealing that he's Stephen's brother. He tells Annalise that he and Stephen had a falling out years ago and haven't got on since. Annalise is confused as to why he's turned up in Erinsborough if he and Stephen don't get on. 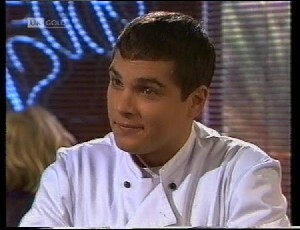 Mark tells her that they should just pretend that he isn't there - in fact, she should forget the name Mark Gottlieb as he is the brilliant French chef, Marcel! Annalise agrees to keep his secret, but only in return for some dishes at the Coffee Shop. Mark scoffs at the idea of working for a coffee shop and Annalise threatens to tell Philip that Mark isn't really French. Mark decides to go and tell Philip the truth himself before Annalise can! Mark leaves and Louise Barker walks in with Debbie and Darren. Louise is being her usual obnoxious self and Debbie doesn't seem at all impressed. Doug is furious that Constructocon don't want to take on his workforce - his workforce are what makes the business! Mr Baker tells him not to be so naive - Constructocon just want the name "Willis Constructions" and couldn't care a jot about anything else. Doug can't believe that he's being asked to sell out his men as some of them have been with Doug since the start of the business. Doug is appalled that Beth will lose her apprenticeship. Baker says that none of it is his problem - if Doug wants to sell, he wants to sell and that's up to him. Doug is clearly troubled and says he needs more time to think. Baker tells him that he has 24 hours before he loses the deal completely. Phil is looking at a mock up of some advertising and pondering the decision of whether it was wise to stick with the Arc de Triomphe or if they should have gone with the Eiffel Tower. Gaby tells him to stick with it and make a new design for the following day with the Tower in and then alternate them through the week. Both of them are very excited about the advertising campaign and Mark appears. 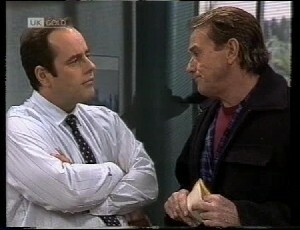 Phil presents the designs to him and Gaby tells him that the radio campaign kicks off that evening, followed by a run in the morning papers. Mark is stunned. Phil explains that they see him as a highly marketable asset and says that they've built an advertising strategy around him. Gaby and Phil start to bicker over the tagline they've devised and Mark looks stunned. He can't believe that they've launched a campaign already and Phil tells him that the agency are working on television spots and glossy print features but he and Gaby were so excited about Mark's appointment, they decided to start off the local advertising themselves. Mark is gobsmacked. He tries to tell Phil and Gaby the truth, but he chickens out and leaves. Phil and Gaby are still stoked about the campaign. Louise and Darren are bored with the Coffee Shop. Debbie suggests going to the park but is mocked by Louise and Darren. DARREN: Nah, the park's a dumb place, Deb. It's for old people to feed the birds and stuff. Louise suggests going to the mall. Debbie doesn't think that is an original idea, but Darren and Louise both mock Debbie because it's a better idea than the mall. Louise suggest that Debbie buy them all drinks to take with them. DEBBIE: Since when am I Santa Claus? Get your own. Louise says that she can't afford to get a drink. Darren offers to shout her and gives Debbie and a handful of money. When Debbie counts it, there's only enough for two. Darren tells her to buy her own and he'll pay her back later(!) Rick walks in as Debbie is at the counter. 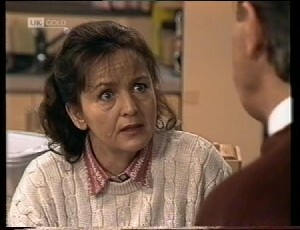 He mocks her friendship with Louise and Darren, which irritates Debbie. LOUISE: Hey, Alessi, come down the mall with us? RICK: No, no I don't reckon I could take the excitement! DEBBIE: What would you rather do? Go down the park and feed the birds?! It's patently obvious that they all hate each other, but Rick agrees to go with them to the mall. A large group of Erinsborough High kids leave the coffee shop. Pam tells Doug that there is nothing to think about - if them selling means that people will lose their jobs, they cannot sell. She suggests that they stick to their original plan of borrowing money from the bank to pay their taxes. Doug is worried but Pam says that if they sold out Beth and the lads, they would never be able to live with themselves. Louise is flirting with Darren. 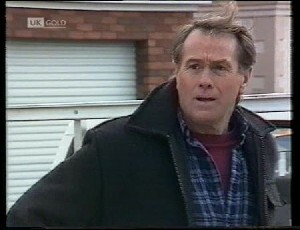 She decides to go "shopping" and Deb confronts her, saying that she thought Louise was broke. Louise confirms she is broke - but who needs money? She waltzes off into the shop and a shocked Deb returns to the others. DEBBIE: She's going to steal it! DARREN: No, no she's not! She's probably going to walk in there and tell the shop assistant that she's broke and she'll probably just give it to her! Rick looks disgusted but the other girls in the group laugh at Darren's quip. Debbie and Rick both reckon that it's a dumb thing to do but Darren thinks that they just don't have the guts. Darren and the girls go to look at CDs and Rick is glaring at Debbie, unimpressed at the goings on. She snaps at him, telling him not to look so superior and goes to join the others. Rick is not happy. Mark finds Annalise and tells her that he has to go along with her little game because he couldn't tell Philip the truth about his identity. Mark reminds her that she has to keep her side of the deal. ANNALISE: Do I look like someone who can't keep a secret? Louise has stolen Darren some sunglasses. Rick is unimpressed and reminds the group that the people they're stealing off are trying to make a living. Darren asks who invited the Sunday School teacher! Louise tells Rick that the shopowners are insured and they put such a high markup on prices, they're not really losing anyway. Darren agrees, saying that they all drive Mercedes and have swimming pools, so they deserve to be ripped off. Debbie tells Rick that if it's such a big drag for him, he doesn't have to come along. RICK: No, no, I reckon I do, Deb, because *this* is just *so* cool. Phil is sneaking from his office across to Gaby's desk and tries to steal a sweet from the bag on her desk. Gaby slaps his hand away. PHIL: Oh, just one more! PHIL: Then I'd eat the lot and I'm trying to lose weight! Just one! GABY: You've had half the packet now! GABY: Have too! And you've taken all the black ones! PHIL: I was doing you a favour - everyone knows the black ones give you cancer! GABY: Oh bull. That's the red ones! DOUG: I can see I'm interrupting some important business. PHIL: G'day Doug. Didn't you ever teach your daughter how to share her lollies? DOUG: We tried, but it was one of the many ways we failed as parents! Doug dives for the sweets and grabs one, closely followed by Phil. Both men laugh as they successfully steal Gaby's sweets. Phil quizzes Doug over the buy-out by Constructocon. Doug tells him that they almost had a deal but it fell through because they wouldn't take on his crew. Phil is worried that if the company changes hands, the start date for the work on the Waterhole would be delayed. Doug tells him not to worry. Phil leaves for his office, grabbing another sweet as he goes! Doug gives Gaby some post. Gaby is surprised - they're just bills. She realises that Doug has come down because he needs a chat, but he's reluctant to talk. He looks very upset about the situation with Constructocon. Gaby says that Doug shouldn't take on loans to pay the tax bill as he shouldn't have money worries - not at his age, and not with the success that he's had - he's worked hard to get where he is. Doug doesn't think he can sell out his employees. Annalise tells Mark that he'll have to do the menu-board because she doesn't think she can spell it in French. He tells her about some of the dishes. ANNALISE: I'm impressed. And I thought you were just a pretty face. MARK: I thought the same about you until I came up against your ruthless blackmailing side. Annalise reckons that as Mark's been such a good sport, she'll have to show him her appreciation. Mark is intrigued, but then spies Phoebe outside and tells Annalise she has a customer. Annalise tells him that it's his sister-in-law and she's the boss. They both go through into the Coffee Shop. Annalise introduces Mark as "Marcel" to Phoebe. ANNALISE: Brooding Frenchman with a secret. ANNALISE: Ah, it wouldn't be a secret if I told you, would it? Mark is not impressed at Annalise's behaviour! He introduces himself as Marcel. ANNALISE: Doesn't he remind you of someone? Mark glares at Annalise and goes back into the kitchen. Annalise follows him as Gaby enters. Phoebe serves Gaby with a coffee and gives her a message for Doug about a broken piece of wood. Gaby spies Mark in the kitchen and she goes over to have a word, causing the rivalry between Annalise and Gaby to flare up again. All of the Erinsborough High kids, apart from Rick, are charging around the mall like idiots. Rick pulls Debbie to one side and tries to make her see sense. DEBBIE: They're Darren's friends, all right? RICK: That's not like an *awesome* recommendation, you know. Darren whispers something to Louise and they all decide to leave. Darren tells Debbie he's got to head off. Debbie says that she thought he could come back to hers so they could work on their science assignments. Darren tells her that would've been a dream come true(!) but he has to help Cheryl out instead. Rick thinks that if Debbie believes that, she'll believe anything. Debbie tells him to shut up and yells Darren back. She's worried that he's going back to his old ways, but Darren is adamant that he's done his time, learnt his lesson and paid his dues. He throws his stolen sunglasses into the bin. Debbie seems relieved. Annalise is tasting Mark's cooking and is impressed. She reckons that between them, they could put the Coffee Shop on the map. Mark tells her that it's just a short term arrangement, but Annalise thinks that they might have to renegotiate! Rick comes in and tells Annalise that he's annoyed over Debbie's behaviour, and he doesn't understand why he's letting it get to him. He spies Mark and Annalise tells him that Mark is a brilliant French chef but he can't speak a word of English. Annalise introduces Rick as Lassiter's kitchenhand to Mark. Rick is not impressed that he has to work with some guy who cannot speak English. Annalise hams this up and makes a big deal out of Rick being able to help Mark to speak English. RICK: Just repeat after me. Repeat. I am a dopey. MARK: I am a dopey. Rick leaves, most amused at himself. MARK: Dopey, eh? This is going to be an interesting working relationship. Doug is looking glum. He steps out in front of a ute as he puts his tools away. 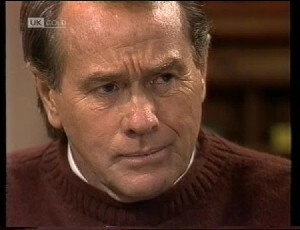 The driver gives him a piece of his mind, telling Doug that if he wants to kill himself, he should leave him out of it! Doug has mended the broken piece of wood for Stephen and Phoebe. Doug and Phoebe comment on how good Wayne has been to Stephen and Phoebe since the accident. They talk about friends helping each other out and Doug gets quite glum, saying that you never know if the same thing could happen to yourself! Phoebe asks Doug if he's ok but Doug makes his excuses and leaves. Louise wants to know where Darren's sunglasses are. He says that he lost them but it's ok; she can always steal him another pair. The two smooch on a bench and Rick spies them. Phil is on the phone to Beth and he's telling her that her job is safe because Doug isn't going to sell out. Annalise comes in with the takings from the Coffee Shop and wants to put them in the safe. Gaby agrees. Phil finishes up his phonecall to Beth. PHIL: Well, I'd better look like I'm doing some work! See you later. Gaby laughs and puts the takings in the safe. 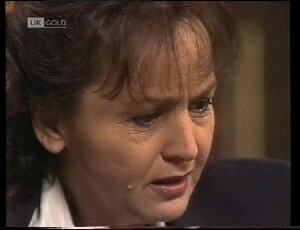 She tells Phil that the agency wants some more information on "Marcel". Annalise wonders which agency they're talking about and Gaby explains that they're handling Lassiter's advertising. ANNALISE: Oh, I thought you meant the CIA or something. GABY: Oh hardly! Why, do you think Marcel is some kind of big international spy? Phil looks thoughtful as Annalise says that she thinks there's more to Marcel than meets the eye. He asks her what she knows but Annalise says it's just intuition. GABY: Well, he's certainly got the brooding James Bond type good looks. I can see us developing a close working relationship. If I find out any exciting secrets, I'll let you both know. ANNALISE: Yes, on the other hand, if *I* find them out first, I'll keep them to myself! Rick has told Debbie what he saw with Darren and Louise but Debbie is reluctant to accept it. RICK: You don't kiss your friend on the mouth for a long, long time, do you? Debbie reckons that Rick is just trying to cause trouble. She says that she trusts Darren and throws him out of the house, telling him to stay away from Darren's friends and from her. Baker is leaving the house as Pam enters. Doug starts going on about how bad things could happen to either of them at any time. Pam thinks Baker has been pressuring Doug. Doug tells her that he's signed the contract and sold the business to Constructocon.